Those of you in your 30’s and 40’s might recognize that quote by Hannibal from “The A Team.” Remember?! It always comes to my mind whenever something works out just like I had planned, and my trip to Safeway tonight was one of those moments. Yes!!! I really only wanted the Life cereal from this deal going on, and wasn’t planning on doing it as there weren’t any coupons for them. That is until I was reminded of the MQ located in the Fred Meyer Extra Savings booklet by our reader, Vanessa. (Thanks!) It is for $3/5 Quaker items and is a manufacturer coupon and does not have a Fred Meyer logo on it at all. So I took it to Safeway with the hopes that it would work. 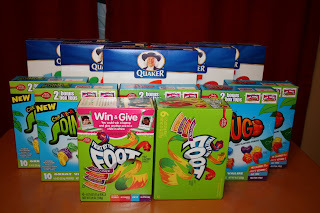 Since I had to buy 5 Quaker items, I decided to purchase 12 items in order to maximize the Betty Crocker catalina deal as well as the $4 instant savings wyb4 deal. Total OOP: $3.20 and received a $3.50 catalina! The Quaker coupon didn’t end up scanning at all, but the cashier pushed it through as it is clearly an MQ. I suppose it will depend on the cashier, so YMMV. Go here for all the coupon links. I got home and showed my husband and he was almost impressed, which was good enough for me! That is, after all, one of the reasons why Angela and I started this blog, to share our coupon successes so we didn’t bore our husbands to death! I tried the Safeway deal on fruit snacks yesterday and the CATALINA's didn't print. I even talked to the Customer Service people and they said that there wasn't anything they could do becuase they come from the manufactures. Any ideas? Where can I find the Fred Meyer book at? I love it. My husband is not impressed anymore either. He smiles and nod. Last night when he saw the mountain of fruit snacks, hot pockets and stuff from safeway he came in and said, "I dont say it enought but Thank you for all you do I love you." Thank you for all your hand work on this blog. I love it and love teh deals too. If you have the cashier just type in the numbers above the bar code, the coupon works fine. They are very small numbers though! Great job!! I love the comment about the husbands, I can totally relate. My husband thinks it's funny to have a coupon addiction, but likes Free stuff! 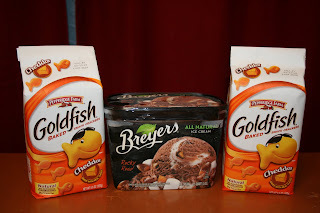 I'm pretty sure the goldfish were $.88 each (at least they were marked that at the store I was at last nite) which would explain the $.22 discrepancy. Forgive me, but I'm wondering how 1.99 plus .99 plus .99 (which equals 3.97) minus a 3.50 catalina equals 25 cents? Is there a coupon for 47 cents off one of those items?? That's so true!! husbands only seem "so" impressed!! It's more fun to share it with your girlfriends!! !